A remodeling project can be fun and exciting to plan, but you also need to keep in mind what’s going on behind the walls. It’s summer, and during this time of year, many homeowners choose to remodel their kitchen. A remodeling project can be fun and exciting to plan, but you also need to keep in mind what’s going on behind the walls. Your kitchen requires plumbing, electrical and gas lines to all be safe and up to building codes. If you’re planning a kitchen remodel this summer, you can trust Master Plumbing to work with you and your contractor to ensure all new and existing plumbing stays safe during the project. In a kitchen, the plumbing system is one of the most important. When walls are being knocked down and counters are being torn out, it’s really easy to knock into a pipe as well. Damaged pipes are not something you want to deal with during your remodel! You’ll need plumbing lines for the sink and dishwasher, at the very least. 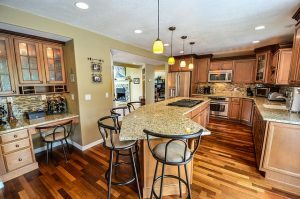 Many other kitchen features require plumbing as well, such as a pot-filler over the stove, a second sink in the island for prep-work, a refrigerator with built-in water and ice dispensers, and others. Another extremely important feature in your kitchen is the electrical components. Almost everything we use in modern kitchens requires electricity: refrigerator, toaster, some stoves and ovens, blender, mixer, microwave and so much more! And let’s not forget those handy outlets along the counter for plugging in small appliances and chargers! It is essential that all electrical wiring in your kitchen remodel be put in the right places, and be properly protected from moisture. If there’s any question of where wiring should go, don’t hesitate to call an electrician! Many, many homes have a stove and at least one oven that runs on gas. Many chefs actually prefer a gas cooktop. Gas lines also need to be carefully protected during a remodel, as there are many risks to even a small leak. This entry was posted on Friday, July 20th, 2018 at 9:48 pm. Both comments and pings are currently closed.